All mod cons. Large terrace. Recent construction. Near to pistes and high speed gondola departure point. Secluded on its own grounds with superb views. 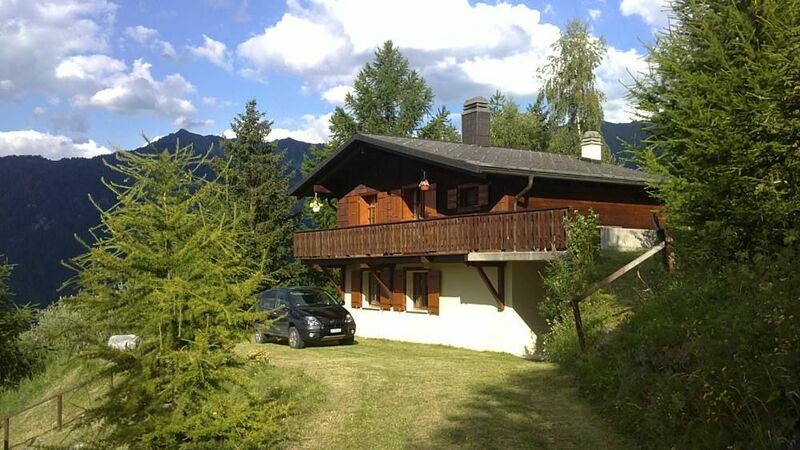 Excellent access to 4 Valleys ski region. Wonderful 10km long sledge run! The chalet was clean and cosy, you can start your hike right outside! There is quite some free space around the property so plenty of opportunity to enjoy the mountain views from any angle or play a ball game...the scenic views on a clear day are fantastic! You can see from your kitchen window where you have hiked in the day! That is especially true if you hike to Lac des Vaux. The top of Mont Fort is breath taking- and possible to get there via the telecabine. The chalet offers comfort on days when it rains, there are board games and alike. We also saw parts of the World Cup games in London on the small TV! We are a family of 5 and we had a great time. I would recommend it! Couldn't rate this chalet more highly. It has a very warm and familiar feel, returning back in the evening really felt like coming home. It is superbly appointed with incredible views and you really can ski literally from the from door and back again. We particularly enjoyed calling back at elevenses for a coffee or a swift beer, and drinks and a BBQ on the terrace in the evening sun was a massive treat in February. It's really easy to access the whole of the Four Valleys and Verbier, where the accessible off piste in particular is some of the best in the world. The skiing in La Tzoumaz was however also fantastic...we were a mixed bag of expert, intermediate and beginners. There was more than enough blues and easy reds for the beginners, some good reds for the intermediate and some really great and completely quiet tree skiing off piste when the weather came in. The whole area is also north facing meaning the snow was a lot better here than elsewhere.The ski back is through a pretty little trail through the woods just off one of the pistes, and to ski down to the lift takes just a couple of minutes through the lower chalets. The kitchen is well stocked, as a group of six, we cooked every night and were not short of anything. The living room with its toasty log fire is a fabulous place to be in the later hours of the day, with the snow coming down outside it feels very cosy. There is plenty of hot water and a decent shower, the heating is set generously and there are plenty of extra blankets for the beds if you like the windows open at night. When the snow came down heavily the car was blocked in, but this wasn't a problem at all as it turned out we didn't need it all week - with a decent rucksack we could ski right into the village, stock up on supplies then simply take the lift back up and ski back to the chalet through the woods with your rucksack full. If you wanted to go hard on the apres in the bars in La Tzoumaz then you would either have to get picked up in the car or face a walk up the hill when the lifts are shut but hey, it'll give you an appetite for supper... If you are a group of mates or family happy in your own company, staying in for nights around the table then this chalet really couldn't be more perfect...will definitely return. Premier séjour en Suisse, à la découverte de ce magnifique pays. Chalet très bien équipé, au pied de nombreux sentiers de randonnée, avec vue imprenable sur la vallée. Nous avons adoré, et nos enfants (3 et 5 ans) auraient bien prolongé le séjour. Adresse à retenir ! Merci. "Nous revenons d''une semaine à la Tzoumaz au chalet l''Ardeve. Tout était propice au repos. Une vue magnifique de la terrasse et du balcon.L''accès au village se fait par un petit sentier proche du chalet. Tout l''équipement est présent. pour les randonnées ,l''accès est lui même très accessible. Nous y avons séjourné avec 4 enfants." "Très beau chalet bien équipé situé dans un endroit très calme et avec une vue splendide." At Riddes (between Martigny and Sion), leave motorway and follow signs for La Tzoumaz. Continue up through La Tzoumaz to the roundabout next to the tunnel, through tunnel and continue to the very end of the Route Des Portes. Take road down to your right past blue shutter chalet and continue down taking left. Chalet is up on your left top of hill. Snow chains or 4x4 recommended if heavy snow - parking available in front of chalet. Thermal Bains de Saillon. Fondation Giannada, Martigny. Verbier.